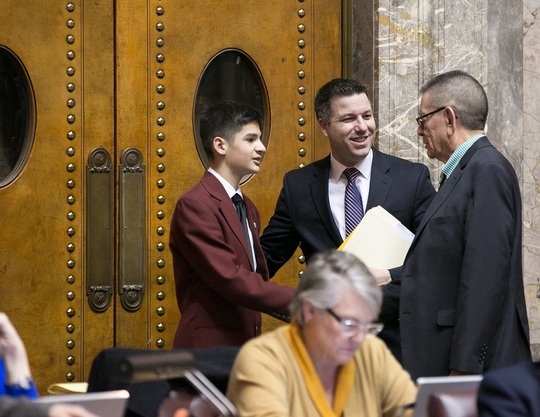 This week I was pleased to sponsor Dillon Esparza, an Eastmont eighth-grader from East Wenatchee, as a Senate page. During a break in our floor action yesterday, I introduced him to Sen. John McCoy of Tulalip, who serves with me on the Senate Natural Resources and Parks Committee. The past two weeks have been very busy for policy committees as two key legislative deadlines for bills have passed. One week ago, the 12 policy committees made final decisions about which bills would advance this session. By the end of today, the list of bills still “alive” will shrink even more after our two budget committees wrap up their work. I am thankful that all of my prime-sponsored bills are still advancing through the legislative process. The Senate is also continuing with debates and votes on bills that had already received committee approval. This process is referred to as “floor action” because it takes place on the floor of the Senate chamber. Next week, the committees begin a break through March 8, which allows the Legislature time to dedicate efforts exclusively to floor action. For more about my legislation and the deadlines we follow, click here to listen to my weekly interview with KOHO radio. If you are receiving this e-mail update for the first time, it’s because the Senate has made it possible for me to reach out to more people across the 12th District. I hope you'll find this e-newsletter informative -- but if you would rather not receive future reports about what’s happening at the Capitol, simply go to the end of this message and follow the directions to say "no thanks." 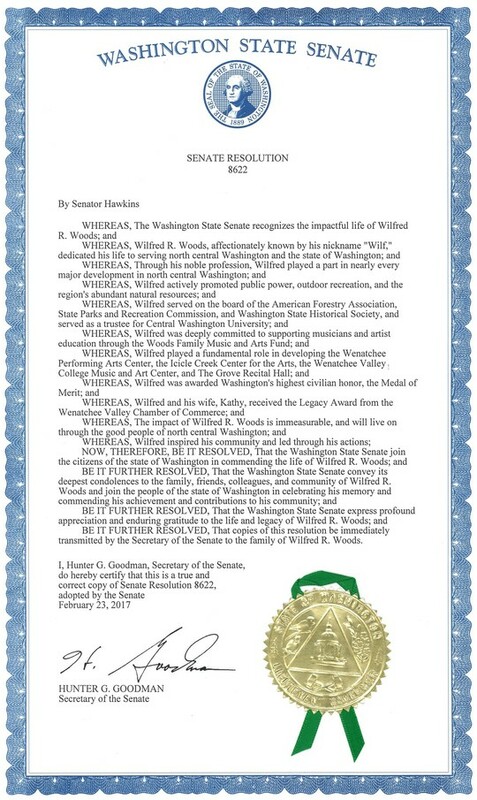 As a Wenatchee native who was a Wenatchee World paperboy once upon a time, I (like so many of us) was saddened by the recent passing of Wilfred Woods – an iconic figure from our area who had been the World's editor and publisher from 1950 to 1997. “Wilf” was a kind, humble, and generous man. He led with his actions and always with a smile. My Senate colleagues joined me yesterday in honoring the life of Wilfred Woods. We were thankful that Wilfred’s son Rufus, seated appropriately at the press table in the Senate chamber, was present to receive the resolution on behalf of his family. Click here for articles honoring Wilfred Woods. Click here to watch the Senate adopt the resolution. My bill to assess and treat the health of wildfire-threatened Washington forests won the endorsement of the Senate Ways and Means Committee yesterday. It is now a step closer to being placed on the Senate voting calendar. Senate Bill 5546 had received unanimous approval from the Senate Natural Resources and Parks committee on Feb. 14. Because it requires funding, primarily for the state Department of Natural Resources, the bill was also considered by the Senate budget committee. The bill has now been referred to the Senate Rules Committee. I will be asking a member of that committee to “pull” the bill to the Senate voting calendar. Should that happen, the Senate will have through March 8 to vote on it. The Senate recently approved Senate Bill 5270, the first piece of legislation I introduced as a senator. I have learned that two customs usually go along with the approval of one’s first bill as a new senator. First, other senators typically engage in some good-natured teasing of the sponsor before voting. In my case, a fellow senator from Spokane remembered how, during my years in the House, I would come over and watch when it was time for the Senate to vote on my House bills – like a hawk, he said. It was meant in jest, but I actually take that as a compliment! Freshmen senators are also expected to share small gifts that are reflective of the districts they represent. I was proud to give each senator slices of Honeycrisp apples and a box of Aplets and Cotlets. SB 5270 would make the Department of Natural Resources’ contract-harvesting program permanent. It now advances to the House Agriculture and Natural Resources Committee for consideration.